This made me laugh out loud today. 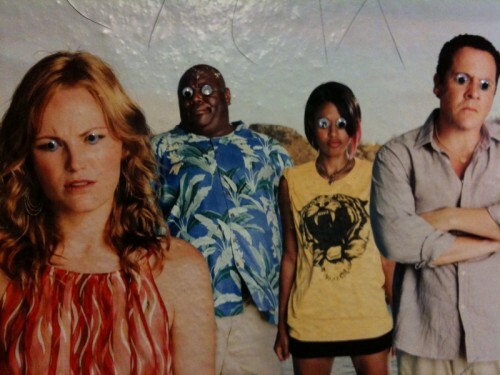 Someone put googly eyes on all of the characters on the poster for the new movie Couple’s Retreat in the C/E subway station on 23rd (once home to a very fine art gallery!) The station continues to be a great place to spot hilarious stuff like this. My first suspects are Googly Eye Cru and Katie Sokoler. This site used to be awesome. Can we go back to that, and stop glorifying vandalism and criminal behaviour? There is plenty of material to cover without resorting to the glorification of juvenile stupidity? When was it that the site was awesome in your eyes? You started leaving negative comments about it in July 2008, just a few weeks after it started. Now well over a year later you keep coming back and complaining. If you don’t like it, stop reading it. What you think is vandalism, I think is art. We are never going to agree. On the off chance you’re a troll and the only reason you leave these comments is to get a rise out of me, I’m going to stop replying. 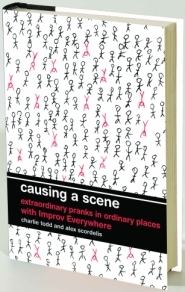 Perhaps I am confusing this site with it’s parent, improv everywhere. I recall that for a long time the rss feed I followed did not glorify repugnant criminal behaviour. So, where is the post about the ‘art’ of breaking windows? Or mugging people? Since crime is ‘art’ and all. Or do you only focus on the eye-sore sorts of crimes? Would leaving blood splatters after a violent beating be ‘art’? Ha! I wonder if it was him? I know he’s in town, so it definitely could be. You might also want to keep an (ahem) eye on Googly Eye Watch.